LOS ANGELES, Calif. /California Newswire/ — What was it like to be in the recording studio as Michael Jackson created the iconic tracks for such monumental albums as "Thriller," "Bad," "Dangerous," "HIStory," and "Blood on the Dance Floor"? Truly dedicated fans will find out from two of the recording engineers who were there with MJ, Quincy Jones, and all the famous musicians as Matt Forger joins Brad Sundberg for the next "In the Studio with MJ" session scheduled for February 8, 2014, in Orlando, Florida. 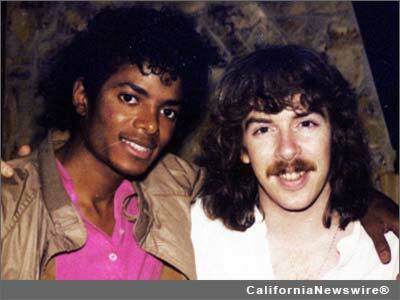 Together and separately, Forger and Sundberg worked with Michael Jackson on studio recording sessions, video mixes, dance mixes, world tours, and more. In addition, Forger recorded and mixed "Captain EO," the groundbreaking film and music project that involved Jackson, Francis Ford Coppola and George Lucas. "Recalling some of the musical moments from the making of this legendary music will be great fun for us and should be enlightening for everyone who attends," Forger states. "It is going to be terrific to play some of the large number of mixes of tracks from all the projects we worked on. Brad and I have enjoyed so many different aspects of the creative process of Michael's singles and albums and it will be exciting to share them," Forger adds. Sundberg has presented his "In the Studio with MJ" sessions all over the world and says he loves the "no script" approach that concentrates on the "stories, music and home videos" of many extraordinary sessions. "With the presentations of music, videos, personal behind-the-scenes stories and photos, this is a unique opportunity for people interested in the music industry, and in Michael Jackson in particular, to see, hear and learn what it was like to work side-by-side with a true music legend," Sundberg states. The event will be held in a professional recording studio and limited to 50 attendees. "This event is ideal for anyone who is a fan of Michael's music, or who is curious about how those albums were recorded and the staggering amount of tapes, tracks and time that was put into them," Forger notes. "In The Studio with MJ" will take place from Noon to 8 p.m. on Saturday, February 8 at Starke Lake Studios, 275 North Lakeshore Drive, Ocoee, FL 34761. Tickets are $249, dinner included. FOR MORE INFORMATION: For ticket information, please visit the event's Facebook page https://www.facebook.com/inthestudiowithmj or the event page itself: http://inthestudiowithmj.com/seminar . To request more information or to schedule an interview with Matt Forger, please contact John Scott G at G-Man Marketing, 818-223-8486.